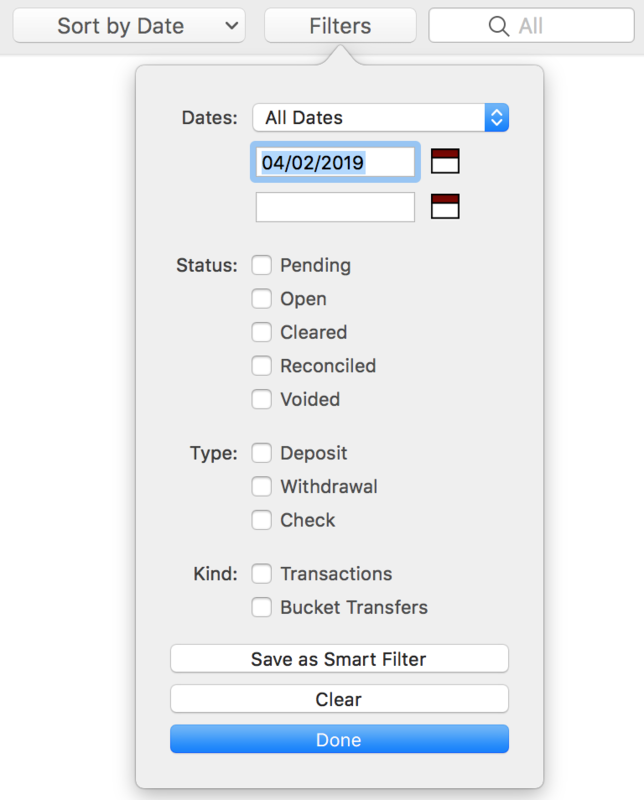 When you need to refine your transaction list further, you can type text in the search entry or click the Filters button in the Filter Bar the top of the transaction list. The criteria in the Filters popover will work in combination with your selection in the Source list. The available options will change depending on the view. Dates: Enter a custom date range or use the drop down to select a predefined range. Those ranges are "All Dates", "Month to Date", "Last Month", "Year to Date", and "Last Year". If you leave a date field blank, it will default to today's date. Status: The options are "Pending", "Open", "Cleared", "Reconciled", and "Voided". Click the button to select the status. Selected buttons will be blue. You can select multiple statuses by clicking each button needed. Type: Transaction types are "Deposit", "Check", or "Withdrawal". You can select one or more options in the same manner as the statuses. Kind: You can limit the view to either transactions or bucket transfers. 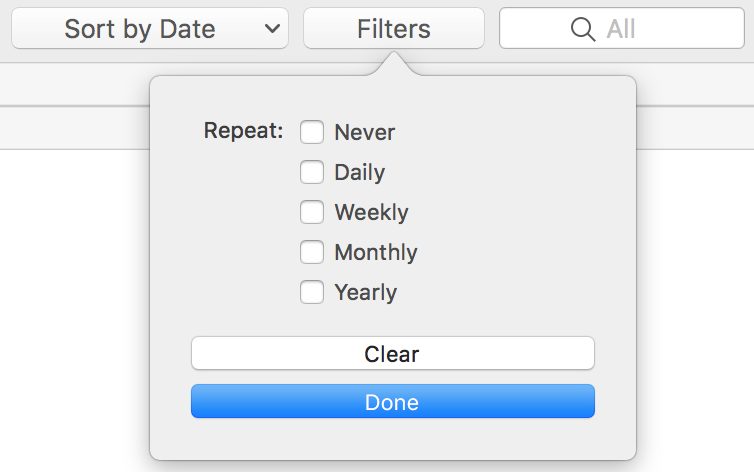 You can click Save as Smart Filter on the Filters popover to create a Smart Filter using the current criteria. You can then access the filter any time from the source list. You can also create a new Smart Filter by clicking the + button at the bottom of the source list. The Reconcile view has similar filter options to the Cash Flow view. It is missing the kind filter because there are no bucket transfers in this view. The Spending Plan view can be filtered by the repeat setting of the events.